By July 1914, the ties between Kezia Marchant and Thea Brissenden, friends since girlhood, have become strained—by Thea's passionate embrace of women's suffrage, and by the imminent marriage of Kezia to Thea's brother, Tom, who runs the family farm. When Kezia and Tom wed just a month before war is declared between Britain and Germany, Thea's gift to Kezia is a book on household management—a veiled criticism of the bride's prosaic life to come. Yet when Tom enlists to fight for his country and Thea is drawn reluctantly onto the battlefield, the farm becomes Kezia's responsibility. Each must find a way to endure the ensuing cataclysm and turmoil. As Tom marches to the front lines, and Kezia battles to keep her ordered life from unraveling, they hide their despair in letters and cards filled with stories woven to bring comfort. Even Tom's fellow soldiers in the trenches enter and find solace in the dream world of Kezia's mouth-watering, albeit imaginary meals. But will well-intended lies and self-deception be of use when they come face to face with the enemy? "An engaging picture of the human spirit in a distant time of war, World War I, from the battlefields to the home front in an English village." "A haunting evocation, from an unusual angle, of the war that cast such a shadow over the whole 20th century. Jacqueline Winspear knows her native England, and the human heart, very well indeed." 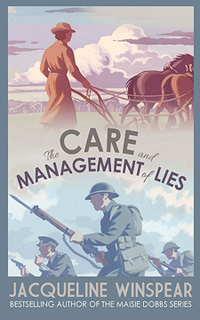 "In The Care and Management of Lies the wonderfully talented Winspear writes irresistibly about the First World War, both in the trenches of France and the fields of England. Her richly complex characters walk right off the page and into our imaginations, as we fight with them, farm with them, cook with them. I devoured this dazzling novel." "Fiction at once fresh and timeless, intimate and sweeping, that chronicles the challenging friendship between a suffragist and a farmer's wife. Set against the backdrop of the Great War, it's a rare stand-alone novel by the author of the beloved Maisie Dobbs series." "What Winspear does, brilliantly and poignantly, in The Care and Management of Lies, is to bring home the enormity of the war by making it personal through the intertwined experiences of four people...Winspear knows the history of the war that changed the world. In The Care and Management of Lies, she's telling us the story, she's bringing it home. Beautifully, tragically, indelibly." 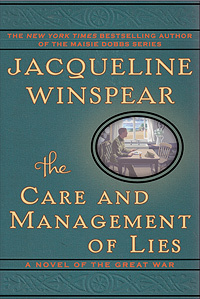 The Great War: It's been almost exactly a hundred years since the start of World War I, and amid all the commemorations, the first best seller pegged to the centennial is not a history but a novel: Jacqueline Winspear's "The Care and Management of Lies" enters the hardcover fiction list at No. 16. Winspear, who now lives in the San Francisco Bay Area, was born and raised in Kent, England, and is no stranger to the war to end all wars—her Maisie Dobbs crime series, about a British psychologist grappling with the war's aftermath, makes regular appearances on the best-seller list. But "The Care and Management of Lies" is a stand-alone novel, about a young bride who learns to take care of the family farm after her husband is sent to the front. (It was inspired by "The Woman's Book," a 1911 homemaking manual that Winspear quotes throughout.) Winspear's interest in World War I is personal: Her grandfather was injured at the Battle of the Somme. In an essay she wrote after touring the site 10 years ago, she remembered him "still removing shrapnel from his wounded legs until the day he died at age 77." "A moving tale about the beauty of those very virtues—fortitude, faithfulness, compassion—that the Great War called into question...The Care and Management of Lies is a quietly powerful story that more than holds its own in a publishing season crowded with novels and nonfiction commemorating the 100th anniversary of the start of World War I." "The Care and Management of Lies pulls readers immediately into Kezia's life. Thanks to a pitch-perfect setting and many-layered characters, we are there as she struggles to find her way in the world, falling in love and striving to be the wife she feels her husband deserves, and then struggling to maintain the farm while enduring the yearning their separation brings. Along with an impossible-to-put-down page-turner of a tale, thought-provoking and still timely questions about the nature of war linger on after Winspear's latest literary success is closed for the final time." "The Great War's impact on the home front and battlefield is portrayed in Winspear's winning stand-alone tale about two girlfriends and how their disparate lives entwine when one of them marries the other's brother...While questioning war's value and showing its terrible effects off the battlefield, Winspear fashions a stunning trajectory for her main characters." "In a stand-alone departure from her popular post-WWI mystery series featuring psychologist Maisie Dobbs, Winspear has created memorable characters in a moving, beautifully paced story of love and duty." "Winspear's fans should welcome the keen period detail and thoughtful tone so familiar from the Maisie Dobbs books, while historical fiction readers will be gripped by this sensitive portrayal of ordinary men and women on the home front and battlefield." "Tom's harrowing ordeals in the trenches and the different experiences of housewife Kezia and suffragette and pacifist Thea open up a window onto all aspects of the war... the dreadful conditions at the front and the emergence of the 'New Woman' in the workplace and at home. Hiding the harsh realities of a relentlessly grim war behind half-truths and entertaining flights of fancy, the central characters rely on optimism to pull themselves and their loved ones through the death and despair. A dark story with a ray of hope burning at its heart..."
"Jacqueline Winspear, who is known for her Maisie Dobbs mysteries about a former wartime nurse who becomes a private detective, has moved into another sphere with this book. It is by far the best writing she has ever done, and it is memorable for its reliance on what was left on the home front as the men disappeared to France ... Jacqueline Winspear is to be congratulated on a moving and remarkable book." "There is power in subtlety. This one is a stunner."